Lets play a little game. 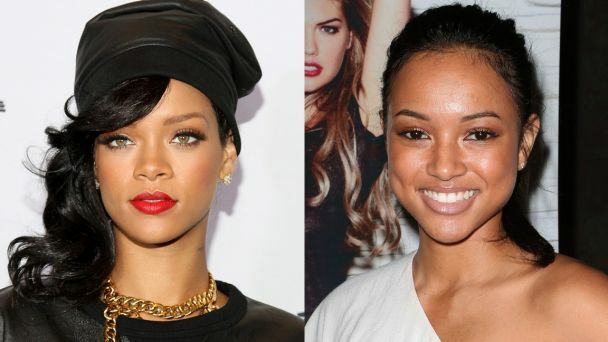 Rihanna and Karrueche may be different but they seem to have more than one thing in common. We all know they have the love they both share/shared for Chris Brown in common so I am not talking about that. What else do Karrueche and Rihanna Have in common? Check out the pictures below and tell me. This is very interesting yo, thanks a million for sharing. are you referring to the hand tattoos? I love Karrueche’s zipper tattoo on the back of her leg. I did notice that she got a hand tattoo recently. KT is just pretty, but she really doesn’t have anything else going for her. The only thing similar to them is that they both have hand tattoos, other than that there’s nothing else really.